The ‘Old School’ is a much-used building in the Crosserlough area. 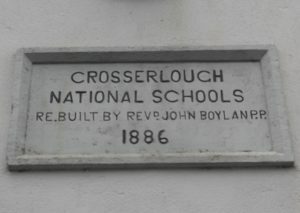 It was built as a national school under the direction of Fr John Boylan in the mid-1880s and opened on 1st October 1886. It is situated in the townland of Cullow, on the Crosserlough to Kilnacrott Road, overlooking Cullow Lake. It continued in use as a school until the current school was opened in 1981. Between 1999 and 2001, the ‘old school’ was renovated. 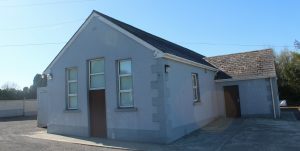 While the ‘old school’ is no longer used as a place of formal education in the locality, it is still a centre of activity in the vicinity of Crosserlough. It is regularly used by the local community for drama productions, dancing classes, meetings, gatherings after funerals and many other events.